Nest Doorbell Chime Guide - What Doorbell Chimes Work With Nest Hello? We’ve been getting lot of questions about what doorbell chimes will work as a nest doorbell chime with the nest hello smart doorbell. In we've covered extensively what transformers will work with the nest hello and how you can use a plug in transformer for your Nest Hello Doorbell chime. But recently we’ve been getting a lot of questions about the best chimes to use as a nest doorbell chime. If you already have an existing mechanical doorbell chime it’s worth trying to connect it to the nest hello there’s a good chance that it will work. 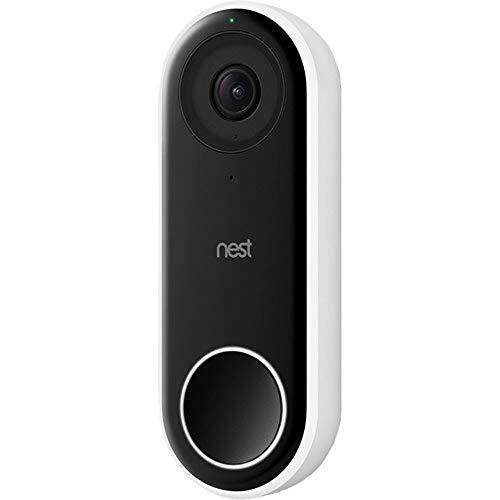 But if you don’t have an existing chime, your existing doorbell chime is burnt out, or you connected your nest hello and the existing chime doesn’t work this post will provide you will the compatible chimes that will work as a nest doorbell chime. Mechanical doorbell chimes, electronic doorbell chimes & google home devices like the google home mini all will work with as a nest doorbell chime. There are two main types of doorbell chimes on the market, mechanical doorbell chimes and electronic doorbell chimes. Mechanical doorbell chimes have a small metal piston that is actuated when the doorbell is pressed and it then creates a sound when it “chimes” a flat piece of metal inside of the chime box making a sound. Electronic doorbell chimes don’t have any moving parts, they have a speaker that can play pre-recorded tones. Most electronic chimes have 10-15 pre recorded tones that you can choose from. Related Post: Does Nest Hello Work With Alexa? We have found that mechanical chimes are the most reliable nest doorbell chimes as they will work with a wide range of voltages and are easy to install and setup as a nest hello chime. Electronic chimes will work with the nest hello but your transformer needs to be providing exactly 16V of electricity to ensure proper operation. With the electronic chimes you will also need to make sure you adjust the correct settings in the nest app to get the electronic chime to play for the proper duration. We have tested the following doorbell chimes with the nest hello and confirmed that they will work with the nest hello. You should also take note that all of the nest doorbell chimes below are all standard size, meaning that the physical internal parts are standardized. If you don’t like the designs we have shown below, you can always take the cover off the chime and put a new standard size cover on the nest doorbell chime. We have physically tested the chimes listed below and recommend that you stick to these below, but you can switch out covers without needing to worry about compatibility. Remember if you don’t like the design of these chimes you can alway install the chime and just change the plastic snap on cover because these are standard chimes. However you should use these exact chimes we list above as we have tested them, know they work, and have stood the test of time. There are other similar chimes from different manufacturers but we have found that not all of the other chimes will consistently work with nest hello. We have had dozens of chimes installed with nest hello with no reports of failures. I personally have a heath zenith chime in my home connected to nest hello and it has worked without issue. I had to install a new chime and transformer when I installed the nest hello because my existing chime box and transformer had burned out. It’s important to note that even though this doorbell is listed as wireless, it will not work wirelessly with nest. The chime will need to be wired in the nest doorbell chime circuit. The electronic chimes will only work if your transformer is putting out 16V. They don’t work well with other voltages, you can check the voltage on the side of your transformer or just buy one like this 16V Transformer. It’s important that if you choose to install an electronic chime that your doorbell transformer outputs exactly 16V otherwise your electronic chime may not properly operate. When you are setting up your electronic nest doorbell chime for the first time you want to make sure that you adjust the volume to 100%. You will need to hardwire your electronic chime it will not work wirelessly with the nest hello doorbell. You should also not install batteries in your doorbell chime, it should only be hardwired. If you hardwire the chime and install batteries the chime will fail. You will also need to adjust the settings in the nest hello doorbell app to ensure they are set to electronic chime, you should also set the chime duration to maximum as show below in the nest hello app during your initial setup. You can then adjust the duration after you get the chime fully setup and confirm it is working. The diagram below shows you how to properly adjust the nest doorbell chime settings for an electronic chime. The google home mini chime option is a great option for people who are installing new wiring for a nest hello without any existing doorbell wiring, because you can then skip wiring a doorbell chime to your doorbell because you can use google home mini as your chime. We have the screen flow walk through of how to connect your nest hello to your google home mini below. It’s important to install both the google assitant and google home app first before attempting to connect your nest hello. You will also need to set up and install your google home mini before you will be able to connect it to nest hello. If your nest hello doorbell chime isn’t working but your nest hello has turned on and is showing a blue ring for full power there could be several reasons the chime is not working. Solution: replace the nest doorbell chime with with one of the mechanical chimes we have listed above. 2 - Your wires are not properly connected in the nest hello chime connector, or not making contact. Or the wires from the chime connector aren’t connected to your doorbell. Solution: Check the connections, if there is corrosion on the wiring clean off with sandpaper to expose good copper and reconnect. Make sure you have a good connections at the chime connector and the doorbell chime. 3 - Your wires are shorting out inside the chime box or in your wiring from the doorbell/transformer. Solution: Check the wires in the chime box, is there any exposed wiring that might be touching unintentionally when you put the doorbell chime cover back on? Test the system with the chime cover off and ensure that no wires are touching that shouldn’t be causing a short. It’s unlikely that you have a short in your wiring to or from your doorbell/transformer but it is possible. These shorts are typically right behind the doorbell. Do you have any wires touching behind the doorbell that shouldn’t be? Other shorts can happen if a nail, staple or screw was driven through wiring somewhere in your home. 4 - Your transformer isn’t providing enough power to drive the chime. Solution: Try everything else on this list before replacing the transformer but if you have a yellow light being shown at your nest hello this is most likely the issue. You should read this post on compatible transformers with the nest hello, and choose one from the list. 5 - Your settings in the nest hello app are not correct. Solution: In the nest app check your settings, by clicking on the gear symbol when you are viewing your nest hello doorbell. Check first to make sure your doorbell chime is on in the settings menu. Once you have checked that make sure you have properly chosen if your nest doorbell chime is an electronic chime. If so make sure you have that you have the chime duration set to maximum as we show in the graphic in the post above. Check the settings and then wait 3 minutes before pressing your doorbell, sometimes the settings need time to update in the cloud. If this doesn’t work toggle everything on, wait 3 minutes then toggle everything back on and wait 3 more minutes and attempt to ring your chime. Solution: Replace your chime with one of the chimes we have listed above. Use a mechanical chime for best results. Solution: Go through troubleshooting steps with nest or return the doorbell and replace with a new doorbell. It’s unlikely that the nest hello doorbell or the nest hello doorbell chime connector is defective but it is possible. Does Nest Hello Work With Google Home Hub?